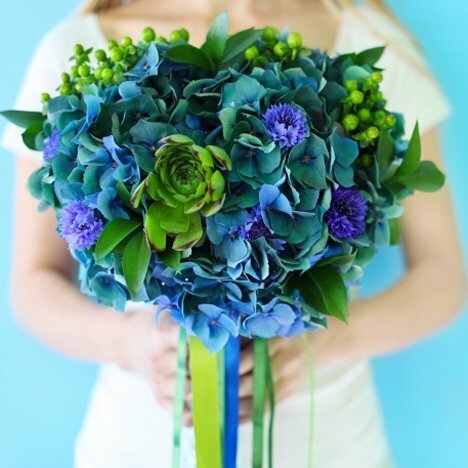 This blue and green hydrangea bouquet has unusual colors blended to enhance the original colors of the flowers. Keep in mind that flowers are natural and organic. Although there are literally hundreds of bouquet in natural colors, sometimes a bride wishes for her flowers to reflect personal favorite colors. 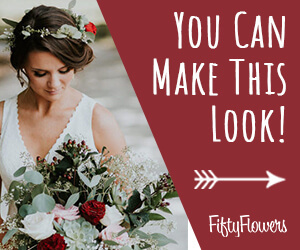 Check out our Bridal Bouquet tutorials for step by step directions, including other referenced products you may need depending on the design style you choose. This bouquet is a combination of hydrangeas, succulents, green hypericum and israeli ruscus and festooned with an accent of ribbons. The bright color combination is literally bursting with a festive feel. The blue hydrangeas, however, have definitely been enhanced for the unusual color. When this is needed, florists turn to flower dyes. I don't usually recommend dyeing flowers to completely change colors. This can be tedious and time consuming, as well as disappointing when the leaves and stems also take on the dye color. Messy buckets can accidentally stain hands, flooring and clothing. 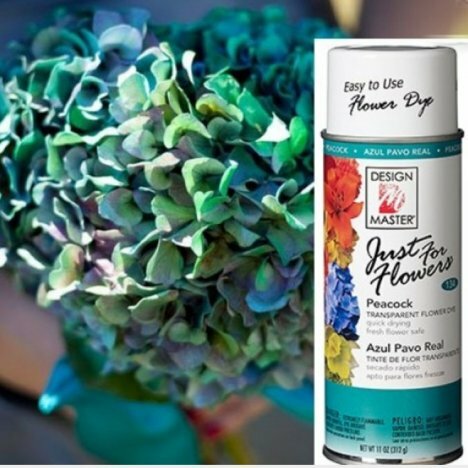 DesignMaster has a range of lovely flower dyes in an aerosol can so that colors can be deepened or enhanced. Our line of paint is safe for fresh flower applications. I prefer the transparent dye, again safe for fresh flower blooms. This dye is safe and is rather transparent, so you can create several applications until the color that you desire is reached. I have many bridal bouquet tutorials in different styles. Although today's brides seem to prefer hand ties, keep in mind that hydrangeas are a very thirsty flower, tending to wilt without a constant water source. I do show, however, show how to create many different mock hand ties, that looks like the real thing while providing a hidden water source. I also demonstrate how to make a true hydrangea hand tie. Check out both tutorials for the one you like the best.